Project Ploughshares was founded in 1976 to promote peace and disarmament. As an operating agency of The Canadian Council of Churches, Ploughshares provides analysis and advice on Canada’s role in preventing war and advancing human security in zones of violent conflict. Our vision is for a secure and just world at peace. Our mission is to articulate policies and strategies based on the best available evidence that will prevent war, build sustainable peace where violence has caused destruction, and control and reduce expenditures on weapons and direct those resources toward sustainable economic and social development. As our name suggests, we want to turn swords into ploughshares. To achieve these goals Project Ploughshares conducts research on defence and security issues; provides analysis and alternatives to the use of force; and engages in dialogue with governments and civil society, both in Canada and abroad, to create policy options for decision-makers and build public support in Canada for understanding and addressing the root and proximate causes of armed violence. From the start Project Ploughshares has partnered with churches and other faith groups, civil society organizations, and governments, providing thoughtful leadership within Canada and with international partners on the changing security landscape. The Canadian foreign and defence policy frameworks have fundamentally changed. While we believe Canadians remain committed to seeing their government make a constructive contribution to international peace and security, which includes providing leadership on conventional and nuclear disarmament issues, the federal government has moved away from these traditional Canadian commitments. As a result, Project Ploughshares needs to adapt and change to fulfill its mission to contribute to a more secure and peaceful world. In addition to our continuing leadership in research and creating policy alternatives, we need to broaden our approach to working with others, inspiring and building public awareness, and tapping into and amplifying the support that exists among Canadians. 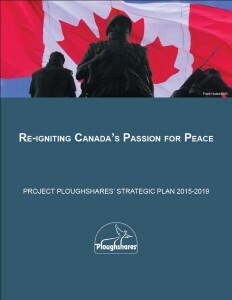 This strategic plan describes how we believe change will take place to reignite Canada’s passion for peace and provides objectives for Ploughshares’ role in this process over the next five years (2015–2019), so that Canada can once again become a world leader in building and sustaining peace.